Technical Car Experts Answers everything you need: Repair Notes for the Breville 820 Espresso Machine and wiring diagrams. 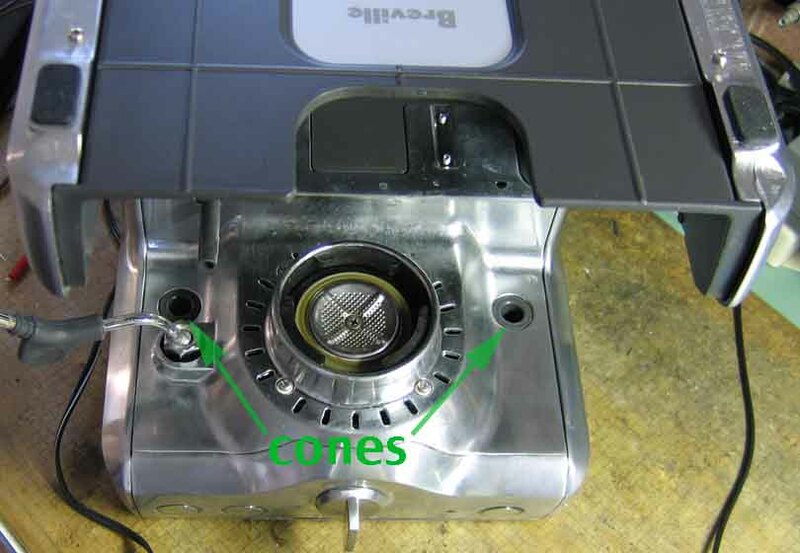 Repair Notes for the Breville 820 Espresso Machine and wiring diagrams. Before doing anything.First of all disconnect the power cord of unit from electric outlet.Naturally, the unit should be unplugged and have all its trays, water tank, and whatnot removed before commencing. The top of this panel is held in place by two offset tabs: push the panel up a bit, do some wiggling, and experiment with the rear water loading tray in various positions. Eventually the panel will come free. This needs to come off to access one of the screws holding the main circuit board protective box. 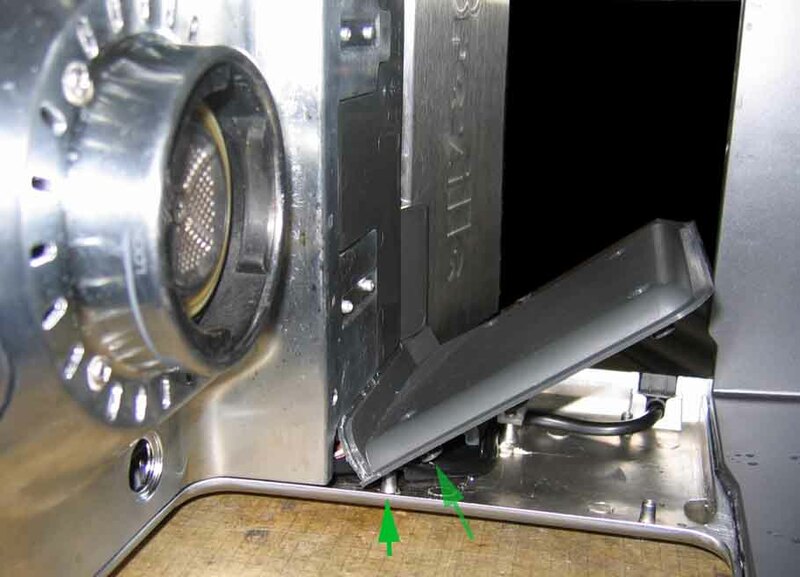 Remove the 4 visible screws holding the left (when viewed from the front of the machine) interior plastic side panel in place. The panel will be happy to come off at the bottom, yet will hang at the top. The hangup points are the two mounting studs for the top screws plus the interlocked plastic piece above. If one pretends that interlocking area is a hinge and does some judicious wiggling, it is possible (though not easy) to get this piece out and back in unbroken. Expect scratches. If this bothers you, you’re on your own loosening the left exterior metal chassis part to discover if that makes this process any easier. 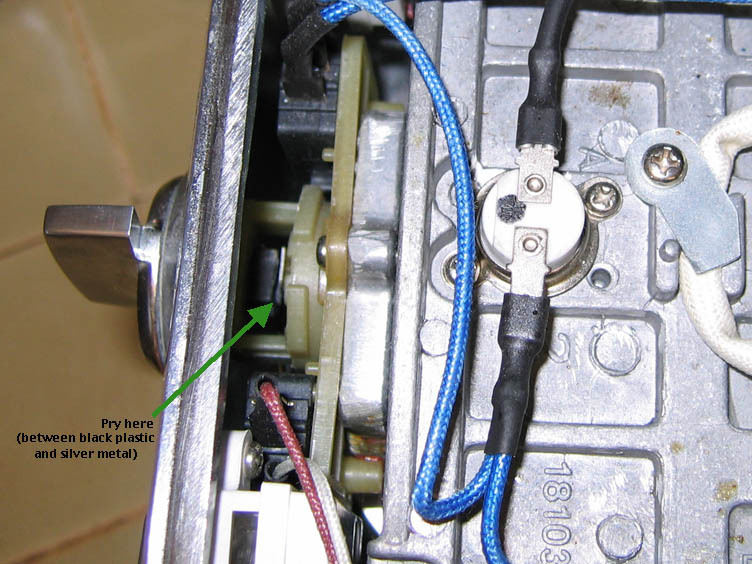 The green arrows show the part of the cover panel and its mating stud, clearly out of alignment as shown here. This one’s a very tight fit: the sides of the unit press inward onto the top cover piece. Look at the inside top of the unit, where the water comes out. Locate two gray cones, one on each side. Each has a #2 Philips head screw about 6 cm from the visible cone entrance: remove these, both the screws and the cones. Open the rear water loading tray and push (actually, whack) the top cover horizontally towards the front of the unit a minimum of 7 mm (1 cm should be plenty). The cover should now lift off, restrained only by the grounding wire, which will need to be unscrewed to allow complete removal. 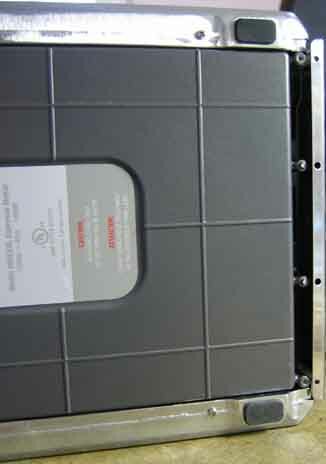 Remove the two screws, one above and one below, holding the box to the chassis left side. Carefully document the wiring. No picture here because Breville did not see fit to use a sufficiently diverse array of colors for a proper color code (likely would drive up the price of these: high-temperature wire insulation), so you’ll need to make your own, or apply paper labels or other markings (and remove them once the work is complete, before reassembling and using the unit, unless they can withstand the normal operating temperature safely, for an indefinitely long time). Once marked, unplug the connectors as needed. For greater freedom of access, unscrew the two screws holding the water tank LED to the chassis. There is one remaining two-wire cable which does not unplug and is not easily freed, other than perhaps by cutting one or more wire ties. This cable goes to the microswitch (one of two) on the Selector Control: the knob controlling the choice of water outlet (this switch is closed when the main water/filter output is selected). I chose to just deal with it, as with everything else disconnected there is sufficient freedom for the work i needed to do. 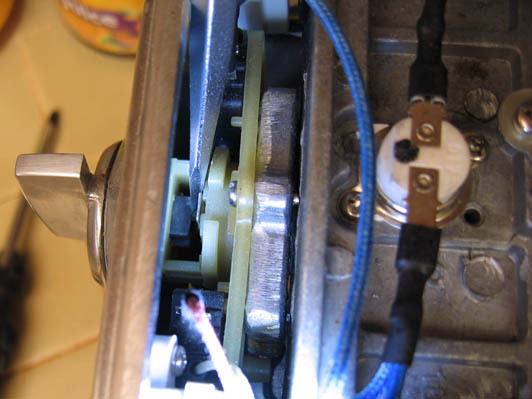 Before I forget it, the take apart ought to include instructions for removing the knob on the rotary valve/switch. I spent a bunch of time on the web trying to avoid breaking something. Finally I took a big screwdriver and pried on the black plastic square that is visible from the inside. With more force that I thought appropriate the knob came out. There was nothing but friction holding it in. I sighed noises of relief. starting with the disassembly described above. This schematics diagram is for all breville 800 series coffee machine.The models 820 /830 850 this also comes in the 800 series. Q1 conducting (turning On) without being signaled to do so. R7 opening and the gate of Q1 not being pulled down to common reliably/sufficiently. P62 (pin 8) of the microprocessor IC signaling Q1 to conduct when it ought not to be doing so… perhaps because the power supply to the IC is out of acceptable tolerances. 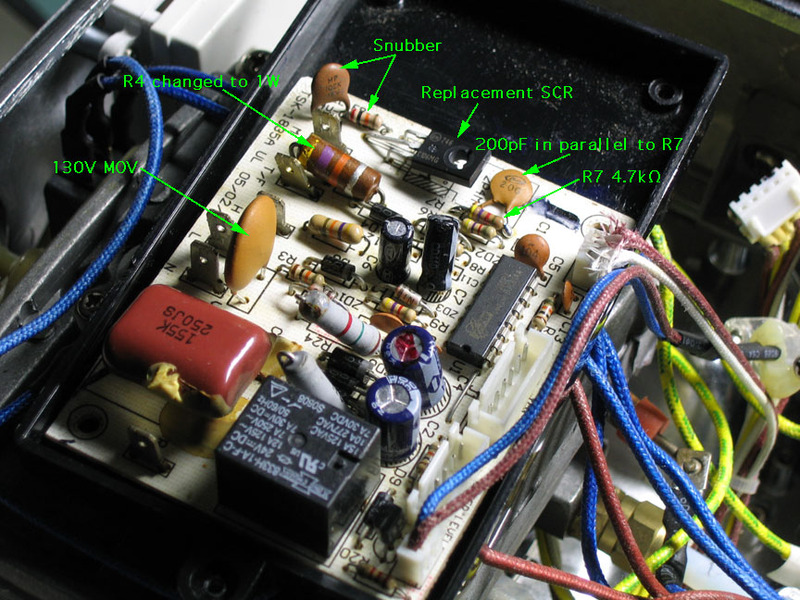 a photograph, showing the added/changed components on control board. Ripple waveforms are line frequency (60 Hz here), not doubled, due to half-wave rectification. Note that our unit uses a 1N5935B 27V 3W 5% zener diode for ZD6. Others have reported ZD6 being a 1N4749A 24V 1W 5% zener diode. The 1N5935B appears to be a production improvement (3W vs. 1W), and i would recommend it over the 1N4749A for replacement. The exact voltage is not critical in this part of the circuit, as it only drives the relay and tank illumination LED. Not sure why the Breville engineers decided to go with 27V, yet i trust them. Our ZD6 has 13 mA flowing through it, for a power dissipation of .36 W. One would think a 1W zener would be OK in this application, yet 3W definitely provides a larger margin of safety, and in this series of diodes, in the same case size. Some people who posted on other sites seemed to confuse one person’s report of a good ZD6 having .46V across it with the actual zener voltage. That person seems to have been discussing the normal forward voltage drop across ZD6 (out of the circuit, i assume) using the diode test mode of a typical multimeter. The best test is really measuring the voltage across ZD6 in-circuit, ideally while varying the incoming voltage to the machine with something such as a variable autotransformer (Variac®, Powerstat®, etc. ): if the voltage stays nearly constant (changes of 10s to low 100s of millivolts OK) with varying input line voltage and remains within the specification for the particular diode (25.6 to 28.4V for the 1N5935B, and probably 22.8 to 25.2V for the 1N4749A), the diode is OK. As usual, a shorted ZD6 would have nearly no voltage across it, while an open ZD 6 would have far, far over 27V across it. If one wants to perform the usual diode test, expect the usual silicon diode result: .4 to .7V (.6 on my Fluke 77 with our particular ZD6) forward-biased, and open circuit (infinite) reverse-biased. I’ve received several emails wondering where to get a 1N5935B in small quantities. Apparently, this is not easy, since this is apparently not a popular part. Fortunately, the circuit is not so critical that this exact part (nor an exact substitute) is required. We already know that the Breville engineers were not concerned with changing the voltage from 24V to 27V, so any zener voltage in this range is OK. The usual safety factor is doubling, so with a power dissipation around .36W, doubled to .72W, in theory any diode able to dissipate 1W or greater should be sufficient. It appears that Breville moved from 1W to 3W in later production, so preferably a 3W or greater power dissipation rating will apply to the replacement diode… yet 2W may very well live a long, productive life. 1W and 5W are the standard zener diode wattages, and most easily found diodes will have one of those two ratings. 5W is just fine, other than being physically larger, especially in terms of the lead wires. It may be necessary to drill the holes in the PCB to accept the wider lead diameter of 5W devices. Both the diodes used by Breville have tolerances of 5%, so we should stick with that (or use a tighter tolerance… 4% down to 1%). Physical package: Axial (tubular body with wires coming out each end). The exact package number does not matter, unless you wish to correlate it with lead diameter. Surface mount won’t work (at least not easily). This is the direct relative of the 1N5935B in the 800ESXL here. It should work very well—every bit as well as the 1N5935B. It is quite possible that Breville used the 27V diode because they could get it in quantity for a lower price… these things are huge consideration for “consumer” goods, to keep them affordably priced. Note that the actual suffix varies: some of these are BG, some are BRLG. I’m so unconcerned with the details of these differences that i did not even look them up. The primary electrical specs (including some not retyped here) match exactly between these types. In terms of which voltage to pick, i might go with what was cheapest or flip a coin: it just doesn’t matter… precise voltage is not a requirement in this part of the circuit. As opposed to ZD1, where precision matters a lot. They’re my last choice because they’re under 3W, and i’d prefer the larger margin of safety, given that Breville decided to go with 3W… or did they do that because at that moment in time 3W zeners were cheaper and/or more readily available than 2W zeners? If i were concerned about problems drilling the PCB holes bigger, then my preferences would flip and i’d take the 2W before the 5W (yet would still prefer the 3W with its higher wattage rating and still smaller lead diameter). The examples above are just that: examples of other choices which will work. Don’t be afraid of wholly different part numbers, as long as the parameters are within the range in the summary above. Use any electronic parts source you prefer/have available.